As you may know from my other blog, The Innkeeper's Husband, I'm writing a book--another book, that is. I'm following up my literary collection of short stories with a sardonic, self-effacing account of my life as an innkeeper--of course. I mean, how else do you follow up your literary debut? And as I was writing and structuring the book, I realized I'd have to revistit an unpleasant time: September 11, 2001. When I say unpleasant, I mean it in only the most objective way. Perhaps being an innkeeper connected me a little more closely to the events of that day than the ordinary American, yet I never suffered the horrors of so many, or that so many suffer still due to the consequences which unfold even as I write. 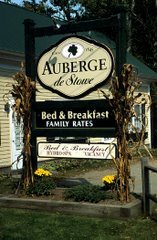 But we did absorb some cancellations, and this on the eve of our first foliage season as innkeepers, a season we desperately needed for the business to succeed. I've written about this several times, and revisiting those articles lances old boils best left untouched. As I revisited those events, what struck me was the difficulty I had in defining myself according to the terms of that day. I found that the old internal struggle had resurrected itself within me. Was I a patriot, or was I a cynical bystander? Or, was there room for something in between? Events like that tend to polarize societies, and for good reason. But action and inaction need balance, like everything else in the universe. And it was my struggle to find balance that caught my attention. It was that search for balance that caused me so much discomfort as I wrote about that date for my book, The Innkeeper's Husband. I never came to any conclusions, no tidy endings, no neat summations. I'm still left with an uneasy feeling as I continue to write. Maybe that kind of internal conflict makes for the best fuel for a writer. Maybe not. But I'm more convinced than ever that remembering that date, revisiting it, reliving it, is critical to our survival as a species. The object isn't to dwell on a subject; rather it's to use the benefits of time to allow a different kind of access, one that might eventually give us the kind of insight we need to put things in their proper places--if, that is, we let them. As an innkeeper, there's almost nothing I won't do to get heads in beds, as long as it's ethical, that is. Last weekend I recruited several friends that I went to Goddard College with to come up for commencement weekend. Commencement weekend for the MFA program at Goddard College is magical, filled with students reading from their completed thesis projects and the legendary Goddard commencement, which faculty member Elena Georgiou always introduces with this warning: "Be afraid. Be very afraid." Not that anything bad happens; to the contrary, the warning is to beware your emotions, which will leave you weepy and happy and spent. So when a couple of the folks I graduated with decided to come up, they were welcome. Before you think I made any money on them, think again. My standing order to friends is this: If there's room (i.e. no bookings by the time you show up), and if you bring food and drink for your hosts, you are always welcome to stay, no charge. This system has worked well through the years, and last weekend Max and Nancy took advantage of this. But the weekend wasn't about business. It was about a homecoming, sort of. To return to Goddard, a magical place in the eyes of the writer, is to reconnect with what makes me vital. It's nearly holy. And more, it's about community, a sustaining and nurturing village of writers passionate about their craft and dedicated to their art. Here, in Stowe, our community of innkeepers mimics the cohesion I've found at Goddard. While I can't say that there's a magical feel to innkeeping the way there is with a Goddard residency, I can say that my fellow innkeepers care deeply about what happens to me, and all of us. And I'm sure many of them open their doors to old friends who can offer nothing more than kinship and beer.